In an 1864 study, 100% of people who cut Hitokiri Battousai did not live to tell about it. Young Shinta is traveling as a slave when bandits attack and slaughter all except for him. Fortunately, Hiko Seijuro saves Shinta and takes him under his wing to teach him the Hiten-Mitsurugi sword art. Thus begins Shinta’s new life as Himura Kenshin, the most feared assassin in the Ishin Shishi. However, Kenshin begins to see things differently upon meeting the mysterious Yukishiro Tomoe. Set during the turbulent Meiji Restoration, Rurouni Kenshin: Tsuioku-hen (るろうに剣心: 追憶編, released in the United States by ADV as Samurai X: Trust and Betrayal) is the prequel OVA to the Rurouni Kenshin television series. Of course, it is much more than simply a story of how Kenshin got his scar. Tsuioku-hen is about as pure as character studies get, particularly with Kenshin. Kenshin is only 15 years old when this OVA takes place and had spent his childhood prior to then either as a slave or training in swordsmanship under Hiko. Consequently, he is torn between a very childish innocence and the ability commit mass murder. As far as he is concerned, he is bringing about an era that would would work for the greater good and some people will need to die for that to happen. Tomoe is a very interesting character as well. She served primarily as the catalyst for Kenshin’s evolution as a character. I don’t really want to spoil anything regarding her, but I just want to say the narrative surrounding Kenshin and Tomoe led to what is one of the best love stories I have ever seen. I have to warn you that aside from the interactions between Kenshin and Tomoe, Tsuioku-hen is a really brutal OVA, where its tone cannot be much more different from the TV series than it was. Some of the deaths were among the goriest ones I have seen in anime. While some may argue the sheer amount of blood was perhaps unnecessary, I think it made perfect sense for the purposes of Tsuioku-hen. Needless to say, this is not an anime for children to see. Subtleties like Kenshin lacking the verbal tics he had in the series would help contribute to the difference in tone, but nothing demonstrated it more than the art and animation style. Visually, Tsuioku-hen is quite possibly the most beautiful anime I have ever seen that was not a Ghibli production. The character designs were given an overhaul for the better, so most of them were drawn to bear a closer resemblance to real Japanese people. Even more than the character designs, a very large number of small things, like the paint selection, how character movements meshed with backgrounds, how Tomoe’s hair moved in the wind, and how blood got mixed in water add up to near-perfection in animation. Visual greatness is probably to be expected from You’re Under Arrest! director emeritus Furuhashi Kazuhiro, but it’s safe to say Tsuioku-hen goes a full head and shoulders above that. The sound is no slouch either. Tsuioku-hen was scored by Iwasaki Taku, who also scored Read or Die. Iwasaki’s score further distanced the overall feel of Tsuioku-hen’s from the series as it was very distinctly different from Asakura Noriyuki’s score for the latter. While Asakura wrote more overt, catchy tunes, Iwasaki opted for subtler, more haunting pieces. I can’t really say one is better than the other since Asakura’s and Iwasaki’s scores simply served different purposes. I thought the voice cast did a phenomenal job as well. 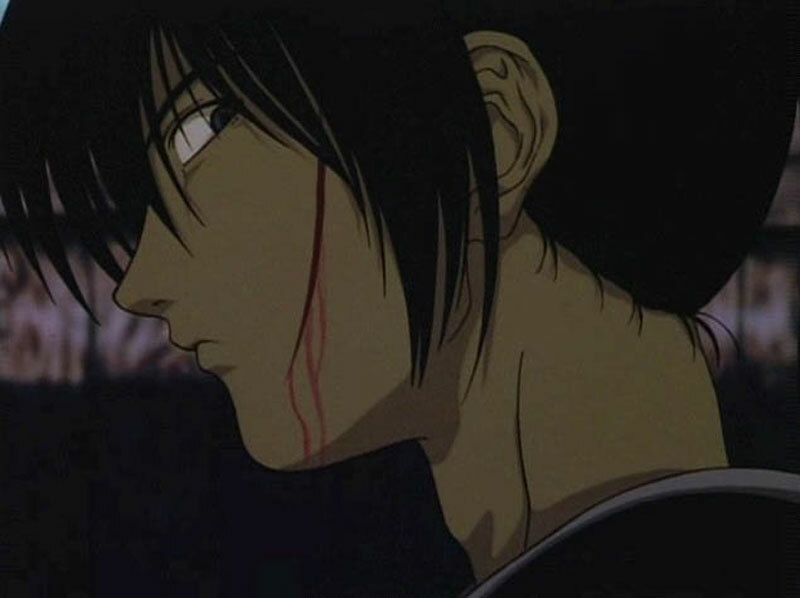 Suzukaze Mayo reprised her role as Himura Kenshin as did Suzuoki Hirotaka as Saito Hajime. Despite being the same voice actress voicing the same character, Suzukaze did a good job of showing Kenshin was not always the noble goof he was in the series, though the writers did plenty as well by having Kenshin lose his “oro?” among other things. Ultimately though, I thought it was Iwao Junko who really stuck out in the cast. I wouldn’t go so far as to compare her being cast as Tomoe to Gregory Peck being cast as Atticus Finch in To Kill a Mockingbird, but I don’t really think a better voice actress could have been chosen to voice Tomoe. Much like a lot of other things in this anime, Iwao just managed to get a lot of the little things right and thus giving a very subtle, but believable performance. Subtle, but believable is pretty much what can be used to describe Rurouni Kenshin: Tsuioku-hen. The only issue I had was that the first episode could have been paced a little bit more well. Nonetheless, if nothing else, Rurouni Kenshin: Tsioku-hen, while not necessarily being a romance, is one of the best love stories to have come out of the anime industry. It goes without saying that fans of the Rurouni Kenshin series should go out and pick this up, but I wholeheartedly recommend that everyone else does as well. I will admit despite being a fan of Rurouni Kenshin, the TV series had its flaws. However, anime really does not get much better than Rurouni Kenshin: Tsuioku-hen, and for that reason it should make its way to every anime fan’s collection.